Style, innovation, nature and luxury all combine into a premium hybrid baby mattress with premium steel coils, soybean cool gel memory foam and natural cotton. 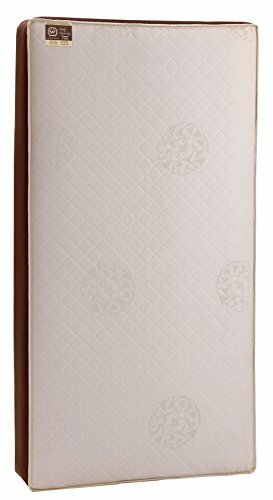 This 2-Stage infant and toddler crib mattress is a hybrid of coil and soy-bean foam that creates the ultimate luxurious sleeping surface with a firmer side for infants and a softer side for toddlers. 204 interwoven posture supportive steel coils are durability tested and highly resilient, providing support as baby grows. Strength pillars placed around the sides, corners and edges provide ultimate firmness. Combined with the steel edges this feels just like an adult mattress! Luxurious cushioning and some the best sleeping materials are designed into the Sunrise with a soybean cool gel memory foam topper for cool comfort on one side. Flip the mattress over for supportive hypoallergenic layers and an organic cotton cushioned layer for a unique feel. Breatheluxe cover offers our exclusive SafetyQuilt cushioned technology for premium luxury - mattress is covered in a durable cotton fabric and enhanced with mesh knit sides so the mattress cover is more breathable on baby’s skin all around, PVC-free mattress cover. A waterproof liner and allergy barrier protects the mattress against liquids from seeping inside and helps prevent household allergens from entering through the mattress through any of the breathable top layering. The memory foam used is CertiPUR-US Certified for air quality, durability and chemicals - this soybean foam is made without phthalates, lead, mercury, formaldehyde, PBDEs, TDCPP or TCEP flame retardants. Stearns & Foster crib mattresses are GREENGUARD Gold Certified for a healthier indoor environment, passing strict chemical and air quality testing. Proudly made in the USA and offers a lifetime warranty on workmanship and materials. Measures 51.63 x 27.25 x 6 inches to safely fit USA standard size crib and toddler beds. Mattress weighs 18.75 lbs.